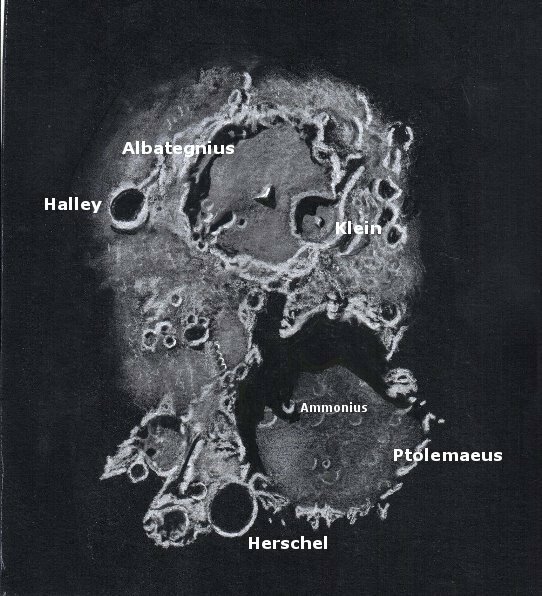 Please find attached a sketch of the lunar crater Plato and its environs….I used soft graphite pencils to do the sketch on cartridge paper. The colours were then inverted on the computer. This sketch is based on a number of observations I have made of Plato in the last year. 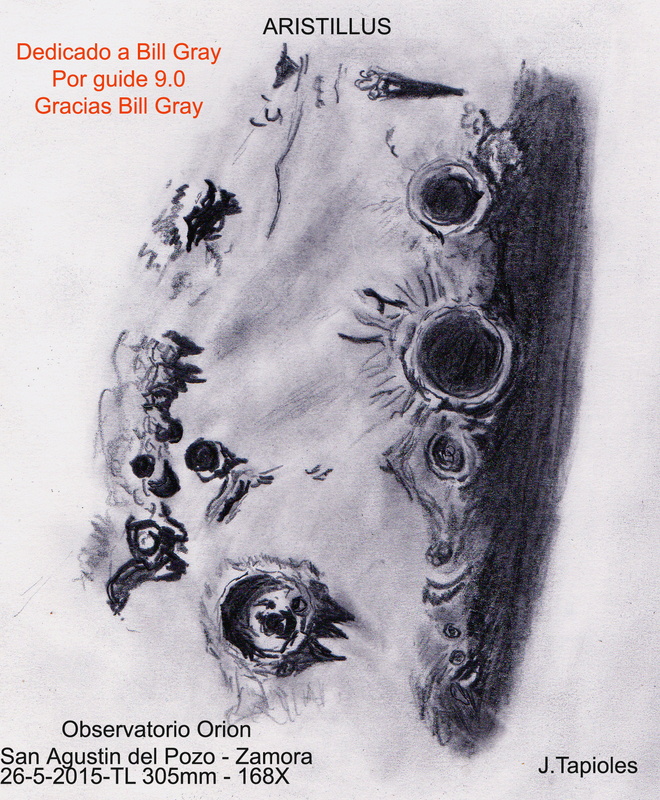 I use a Meade LX90 GPS telescope. It has an aperture of 203mm. Plato is one of my favourite regions on the Moon as I love how the crater is filled with deep shadows when the sun is at a low angle. I also have a website with more of my photographic work at Photos of Weather. El dibujo esta realizado en cartulina blanca con lapiz de grafito observando por un 12″ a 168X . El dibujo fue realizado el dia 26/5/2015. The drawing is made of white cardboard with graphite pencil looking for 12 “to 168x. The drawing was made the day 05/26/2015. Crater Davy (35 km.) 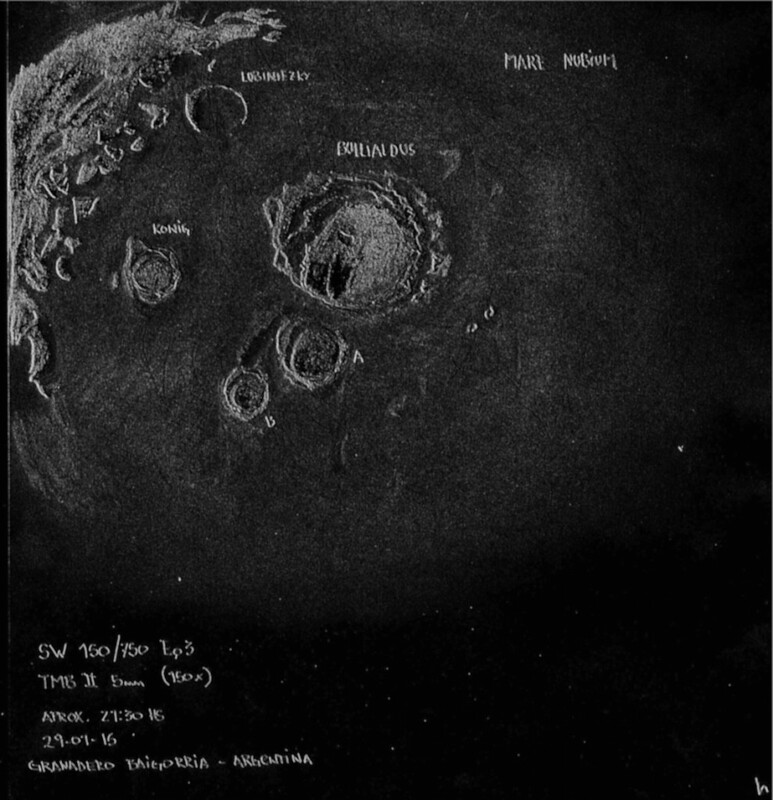 and the Davy crater chain (catena) were my targets for this evening of sketching and although the seeing and transparency were predicted to be above average that was not the case. The Davy crater chain is 45-50 km. in extent. It arcs across the floor and eastern rim of crater Davy Y (70 km.). Since it does not line up with any impacts of note it is not likely a sequence of secondary craters. There is also no evidence of volcanic activity associated with this chain. Robert Wichman and Charles A. Wood as well as H. J. Melosh and E. A. Whitaker believe that a comet (or asteroid) may be responsible as it broke up while inside the Earth’s roche limit. As it went in on the moon like a train of meteors it would have created a chain of impacts. A paper published in 1994 by Melosh and Whitaker explains the hypothesis. 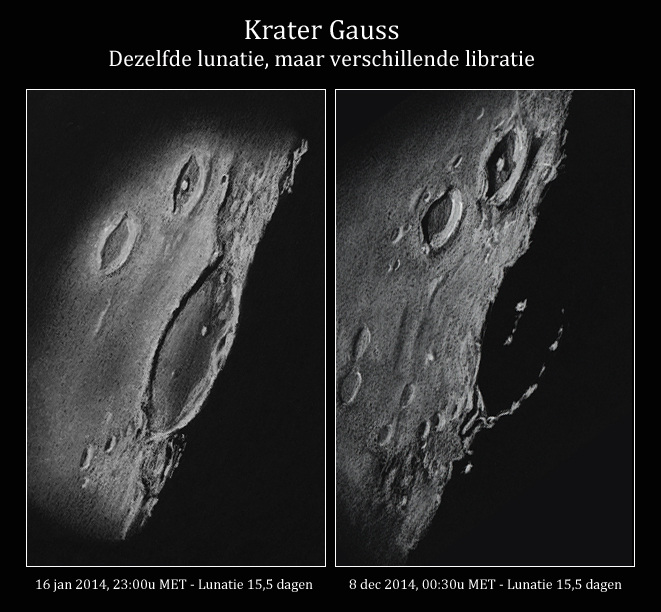 Crater Chains on the Moon: Records of Comets Split by the Earth’s Tides? 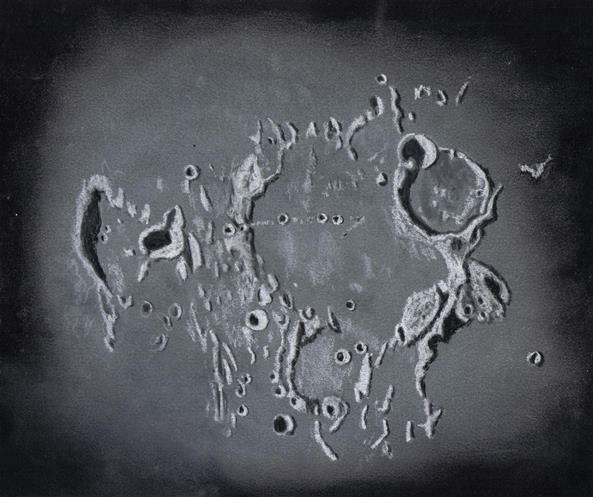 ; H. J. Melosh and E. A. Whitaker, Lunar and Planetary Lab, University of Arizona, Tucson, Az. 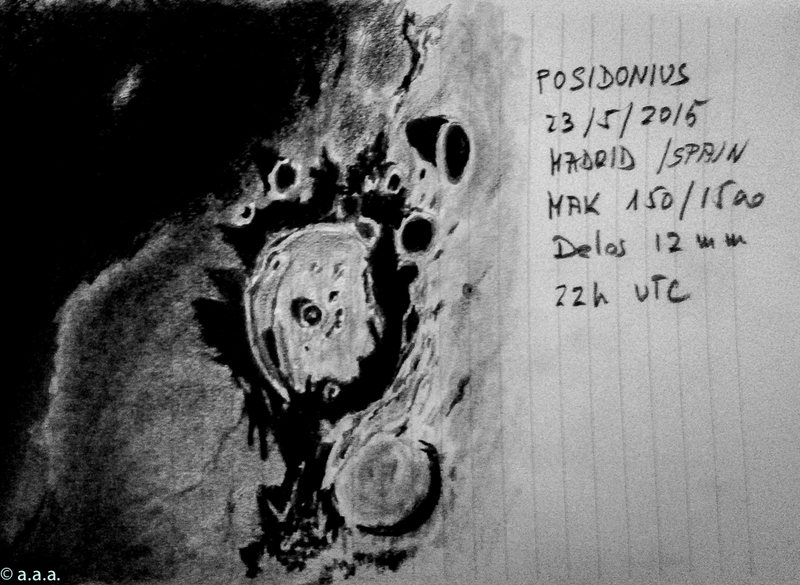 Hi folks, this is a sketch of the moon crater Posidonius. It’s a nice crater 100km diam. at the East border of Mare Derenitatis, beside Lacus Somniorum. To the West, the light line is Dorsa Sirnov. Adjacent to Posidonius is crater Chacornac ( 54km Diam.) and on the other side, Danelli ( 28 km diam). 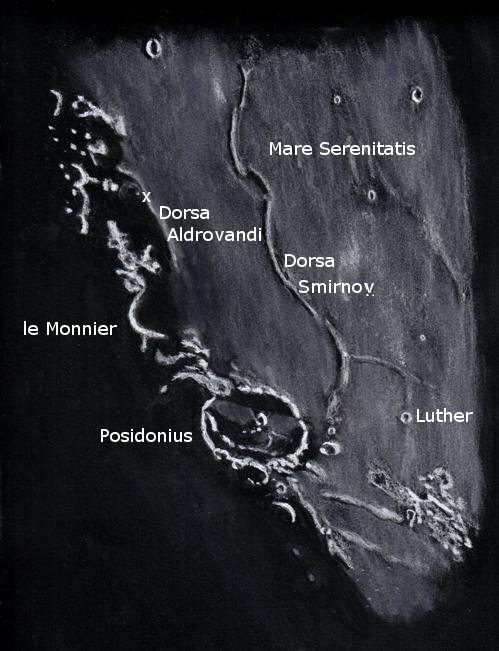 Posidonius es un bonito cráter de 100 km de diámetro en el límite Este del Mare Serenitatis junto al Lacus Somniorum. Junto a él, el cráter Chacornac ( 50,4km de diámetro) y al otro lado, el cráter Danielli ( 28 km diámetro). Al oeste , la Dorsa Smirnov que es esa línea clara justo en el Terminador. 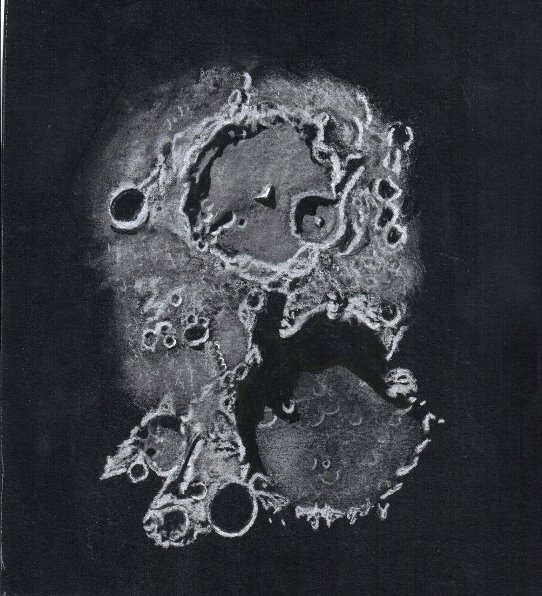 Hi, this was my second drawing of the moon. It took me a long time to finish it but I couldn’t resist to draw the most beautiful part of our satellite in my opinion. 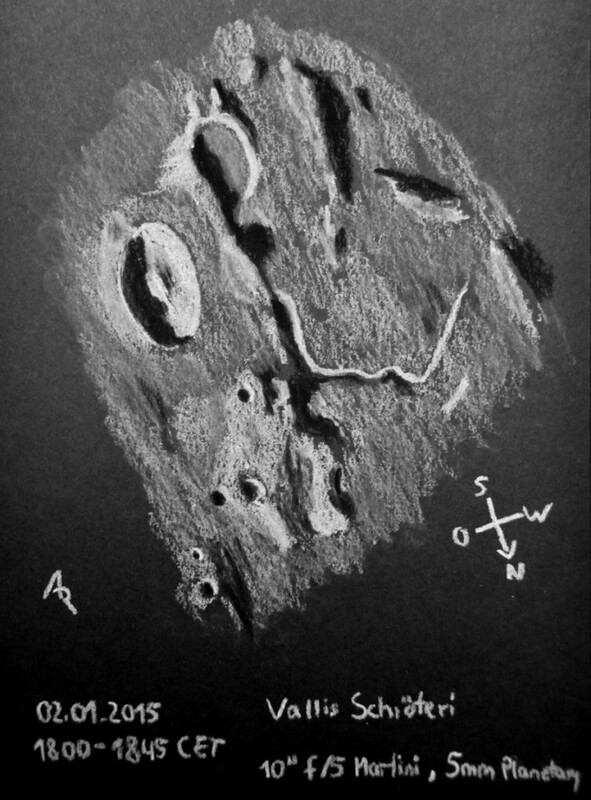 I submit my most recent lunar sketch of Sirsalis & Damoiseau Craters at the western limb of the moon. What a wonderful area to explore with interesting concentric craters of Damoiseau & the double crater of Sirsalis at this angle of light. Unseen Grimaldi is in the darkness to the west. Hello Artist of the nightsky! How are you? i come after long time and many problems,in my family and out…. But i not stopped my asketch activity. i return to asod with my last Moon sketch made with my old Refractor Kenko 80/1000. The sky was clear and i take my telescope and placed it on my roof in front my home. The image was perfect,still and my eies was concentrated to tryade of craters: Theophilus ,Cyrillus and Catharina. I see many shadow and particulars of surface……incredible show!! Last evening proved to be a fine night for observing the Moon and the planets. The atmosphere at sunset settled down to a Pickering 8/10 and 9/10 for brief intervals. This was predicted so I had two telescopes outside (my 18 inch f/4.9 and 13.1 inch f/6 both Dobsonians). At 373x using the 18 inch scope I could clearly see the floor of Palus Putredinis (The Marsh of Decay) and not far away Rima Hadley at the foot of Montes Apenninus. I spent a 3 hour interval on this sketch but actual sketching time was more like 2 hours. The sketch was done using the smaller scope because it is driven. 4 mm and 6 mm eyepieces gave me magnifications of 499x and 333x and occasionally I used the 18 inch scope to verify some of the meanders of Hadley rille and other small features. I have marked the landing site (red dot) of Apollo 15 Lunar Landing Module which occurred the summer of 1971, a very exciting time for the US space program. 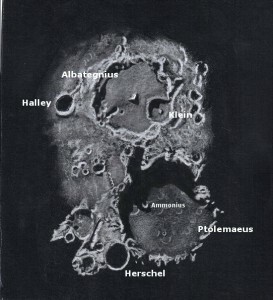 Craters visible in this sketch include Hadley C 6 km. in diameter and Aratus (10 km.). For this sketch I used: Gray sketching paper, 9”x 11”, white and black Conte’ pastel pencils and blending stumps. 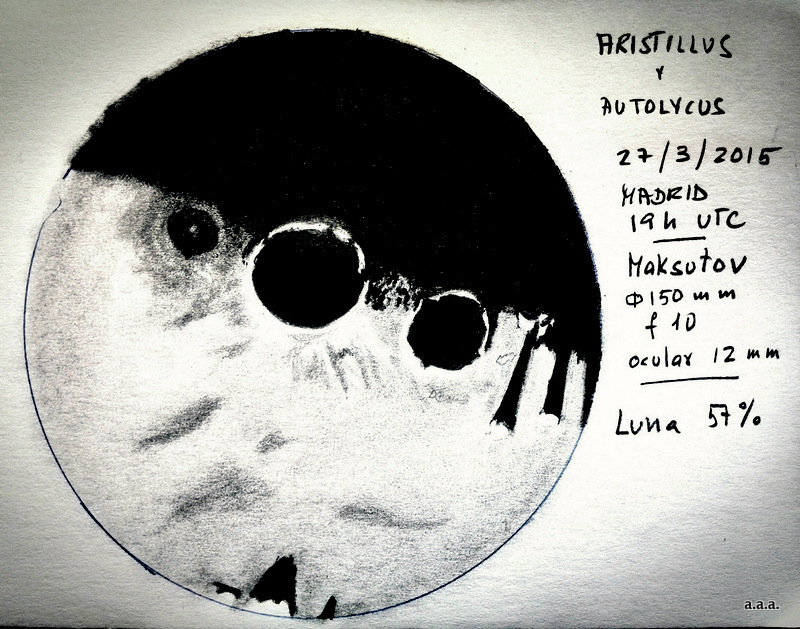 yesterday evening just before the altocumulus clouds of the approaching depression covered the sky, I could do another sketch of the moon: This time it was crater Posidonius and its surroundings. This is a sketch ive made through my Polarex/Unitron 75mm refractor. 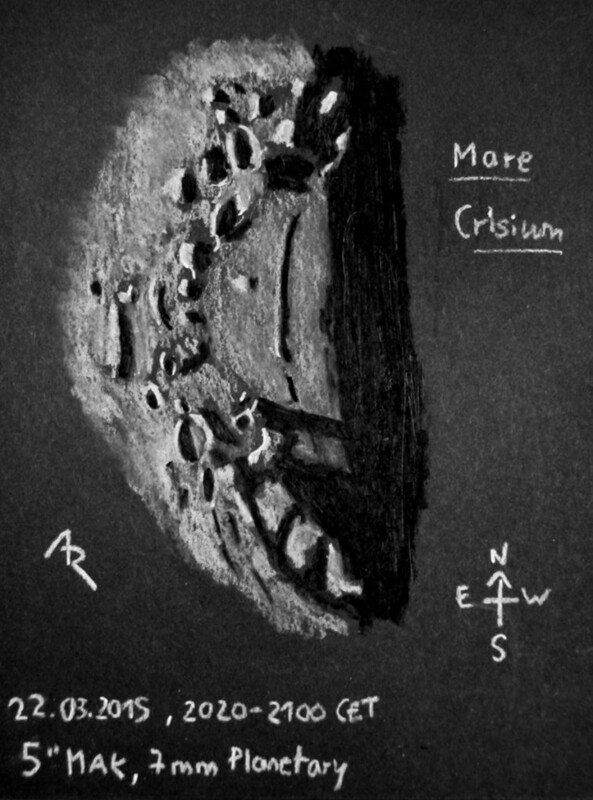 find attached a charcoal and pastel sketch of the sunrise at Mare Crisium. I hope you like it. On the western side of Mare Imbrium are craters Diophantus (19 km.) and Delisle (25 km.) 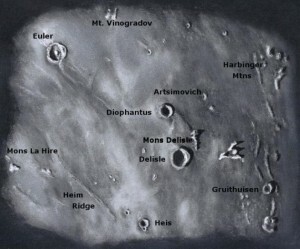 with mons Delisle in between and closer to the crater of the same name. 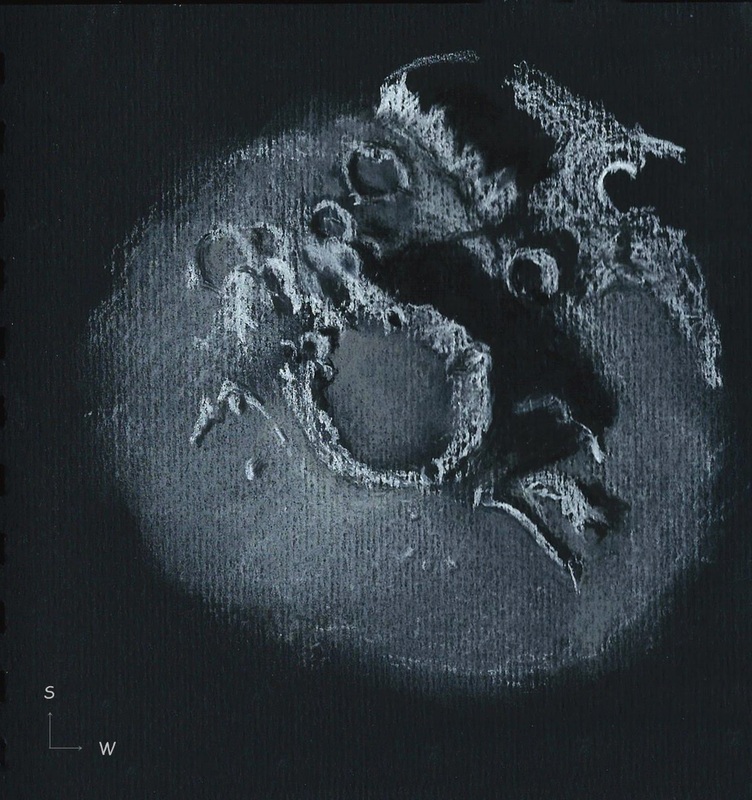 A dorsum or ridge here is perhaps a buried crater rim and creates a sharp edge curving demarcation on the terminator side of the Moon at the time of sketching. Some of the massifs in this region such as mons La Hire (1.5 km. high), mons Vinogradov (1.4 km.) and mons Delisle( 0.8km. high) are described by some geologists as likely left over remnants from the rings of the Imbrium impact. Additional craters seen at this observation included Euler (2.8 km. ), Artsimovich (9 km. ), Gruithuisen (17 km.) and Heis (15 km. )and numerous smaller unnamed. For this sketch I used: black Strathmore 400 Artagain paper, 9”x 12”, white and black Conte’pastel pencils, a soft charcoal pencil, brush and a blending stump. This sketch is one of the renderings I am doing for the Astro League’s Sketching Award Program. The moon was in Aries as it was setting over the Pacific. I was able to get some of Mare Crisium. 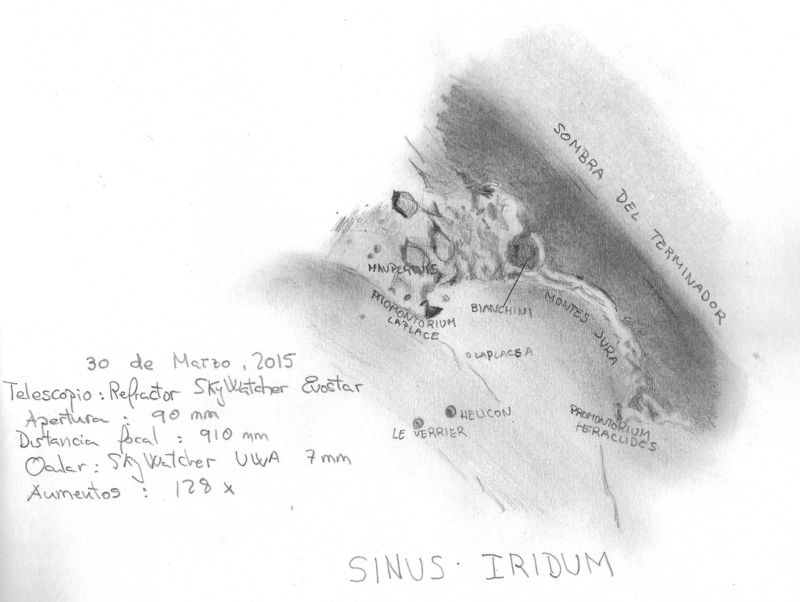 This was done at the Haleakala Amateur Astronomers’ site at the summit of Haleakala this past Sunday, March 22. 2015. I viewed it with my C925/CGEM on a pier with a 2″ Swan 40mm EP at 58X. tonight I had a look outside and – yeah, no clouds and clear skies. 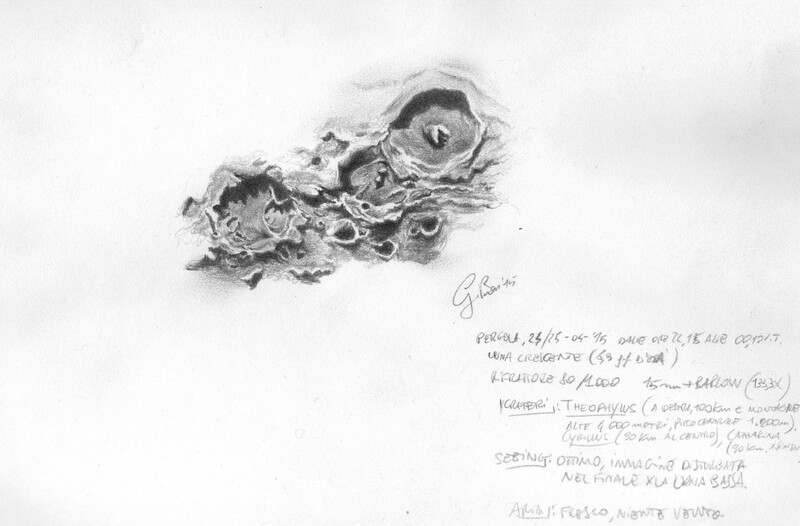 So I took out the 10″ f/5 truss dobsonian and prepared for lunar sketching: Today the floor-fractured crater Gassendi attracted me and presented nice central peaks and its rimae on its ground. Hope you like the sketch. For those that observe and sketch the Moon, trying to pick targets just before, just at and just after first quarter can be much fun because there are so many choices in good relief. 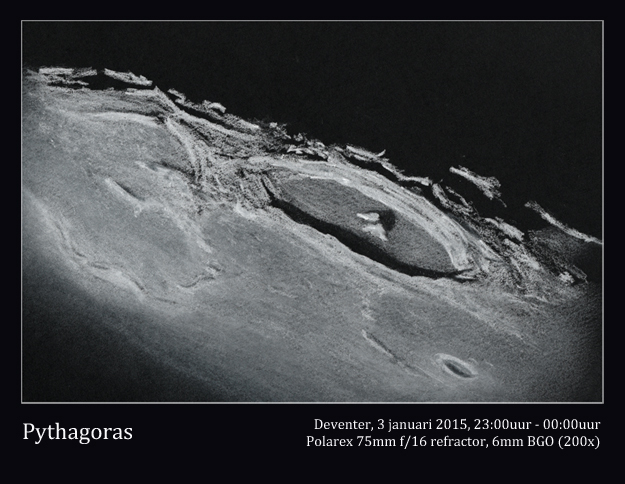 On this occasion I chose two large walled plain craters near the terminator. Albategnius (129 km.) the younger of the two ancient craters and further from the terminator it was displaying its central peak (1.5km. tall) and large crater Klein (44 km.) on its rim. Crater Halley (36 km.) to the northeast is notably a kilometer deeper than Klein and although further from the terminator has a completely shadowed floor with that greater depth. The other large crater Ptolemaeus (154km.) was on the terminator at the beginning of my sketch. With the sun so low the rim shadows were long and were creating a special effect. In combination with the rim shadow of little crater Ammonius (8.5 km.) I could see old Nesse. Jim Adlhoch describes the floor shadow as looking like the head and neck of the Loch Ness monster- see Lunar Photo of the Day September 4, 2014. Crater Ptolemaeus has a floor covered with many shallow bowl shaped craters, ghosts buried under lava. 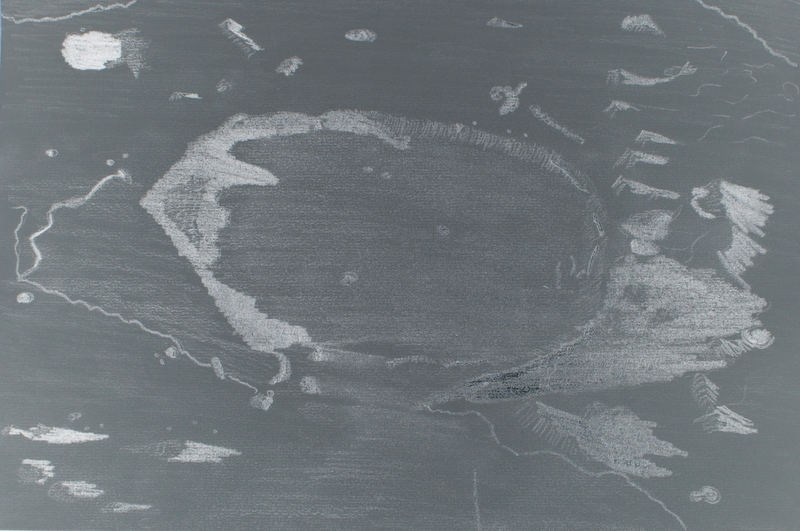 These ghost craters can be seen at low sun but the central peak is completely absent. To the north is crater Herschel (41 km.) with a shadowed floor. For this sketch I used: Black Canson sketching paper, 10”x10”, white and black Conte’ pastel pencils and blending stumps. cratère Blancanus au T400x450, Nouvelle Calédonie. 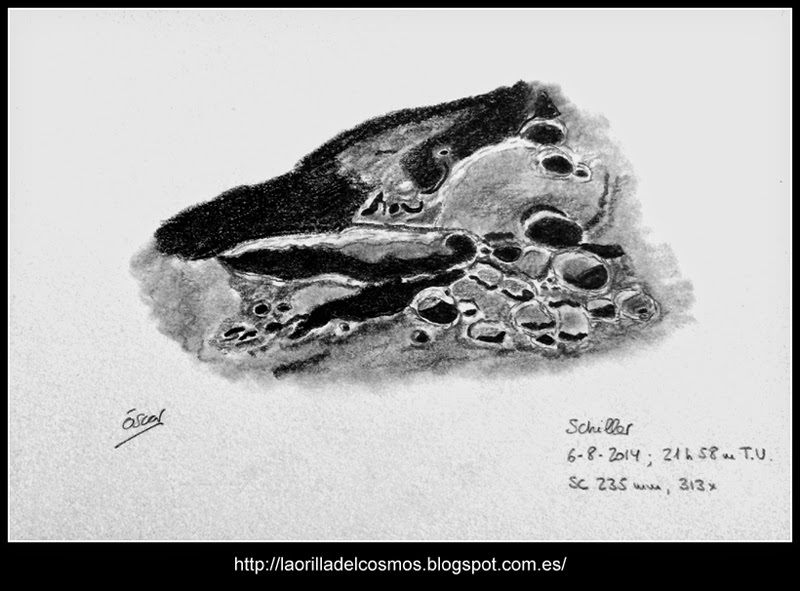 Yesterday evening I could sketch the wonderful pair of craters Atlas and Hercules with charcoal and chalk on black cardbox. 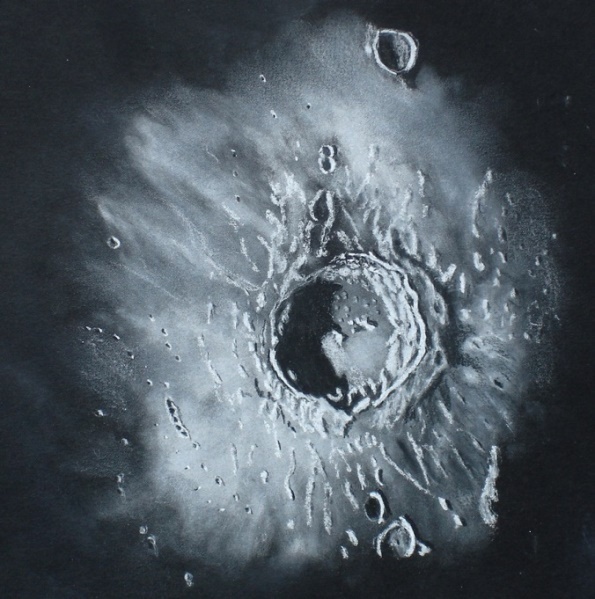 This was the second sketch I did of these craters. I had a look into my archive and compared the current sketch with the one done on May last year. 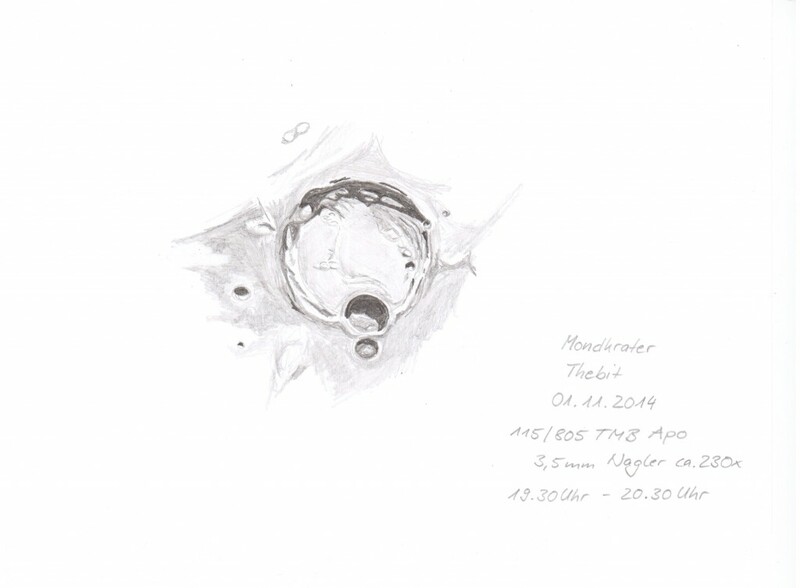 Both sketches have been done with my 5” Celestron MAK. What we can see is the different lighting conditions based on moon age and libration. Furthermore, the seeing conditions last time have been much better than yesterday – I could not go up to 300x yesterday but had to leave it with the 7mm EP. 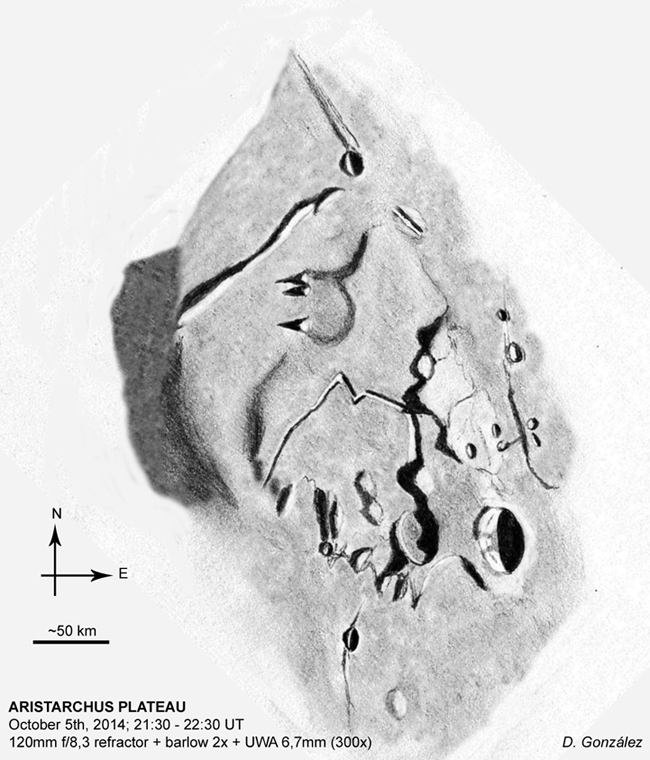 Schiller crater formation is still unknown, but one of the most plausible theory argue that due to an impact of a small asteroid or comet fragmented with a small impact angle. 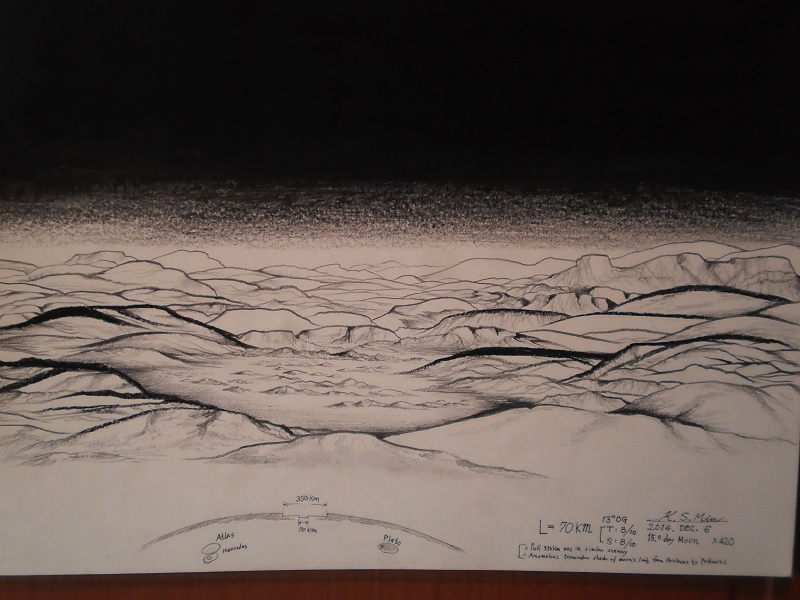 While I was observing and drawing this beautiful crater, I imagined what it would have been to observe the crash and its immediate aftermath. Actually, the moon never disappoints. Telescope: SC Celestron 235mm (9.25″); CGEM mount. The night on December 6 , 3;00-4;00 am was great to observe the 15day moon. 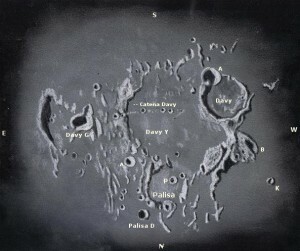 After study some pdf Taurus-Littrow Valley ,NASA, in web, l looked through the eyepieces and soon l found the position of the 15day lunar shade terminator was wrong and strangely for, l remember the lunar phases on 15day moon were always [East-West]ward apparent, this time it was anomalously [North-South] ward. 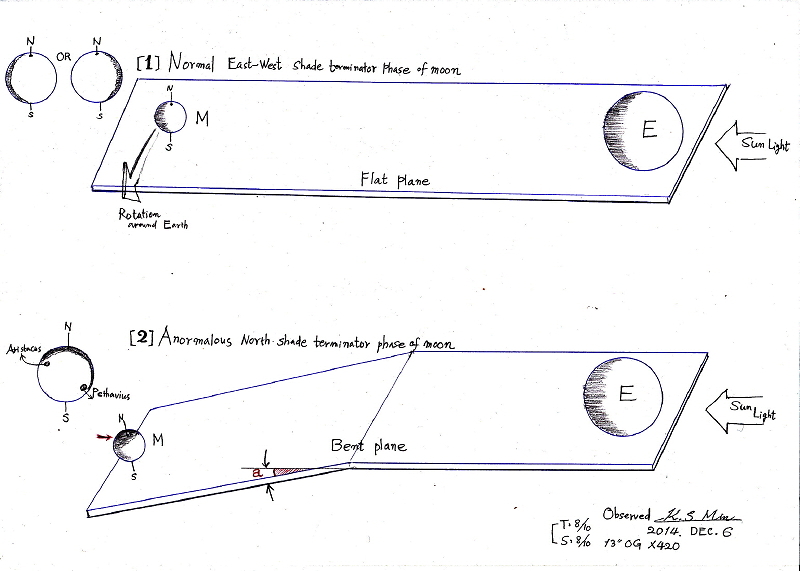 l think it was not because by libration definitely but by some unknown force pushed the moon downward against the flat normal orbital plane of moon-earth system. l was so tired that night that l had only one hour observation not enough time to check how the limb shade was changing even l could’nt sketch reasonably well the old China or Korean Taoism like landscape and this magnificent similarly scenery was stretched along the limb almost 350km long and of course my limitation was only 70km span , yes-, l have also experienced the Grand Canyon like scenery once with the 8′ og in Dec 2013, twice was recently with the 13″ og 1.5months ago. Now is a Taoism scene. in this night I used my TMB 115/805 to observe the moon. 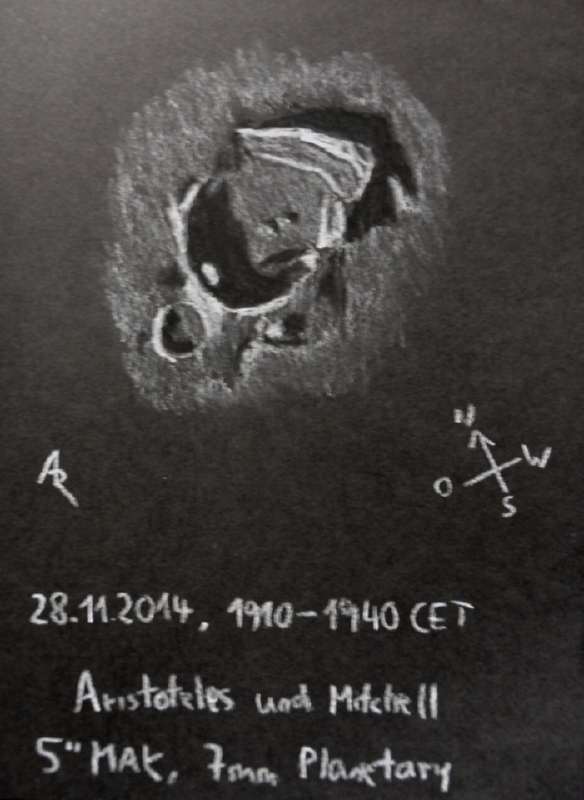 After half an hour (I have started around 19:00 clock) I decided to hold the crater “Thebit” for my log. Partly it has not occurred to me somehow and I took more than an hour before I could go on for fine work. The proportions did not want to go out of hand and the many subtleties difficult to carry auf’s paper today. Everything was pretty numb, pins “dashed” strange and haze-winding soaked the paper so that it rippled. All in all I am very happy to have seen it. It was a great Show. 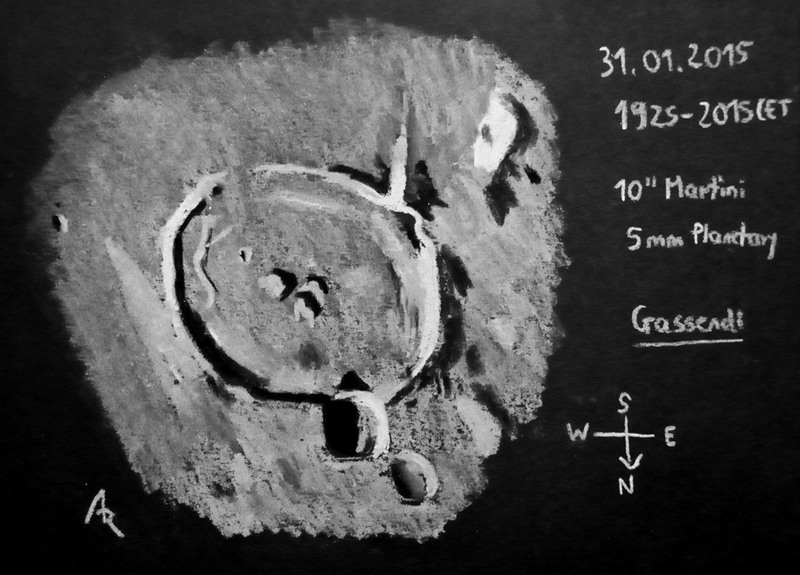 Last night I made a sketch of Lunar crater Gauss and its surroundings. 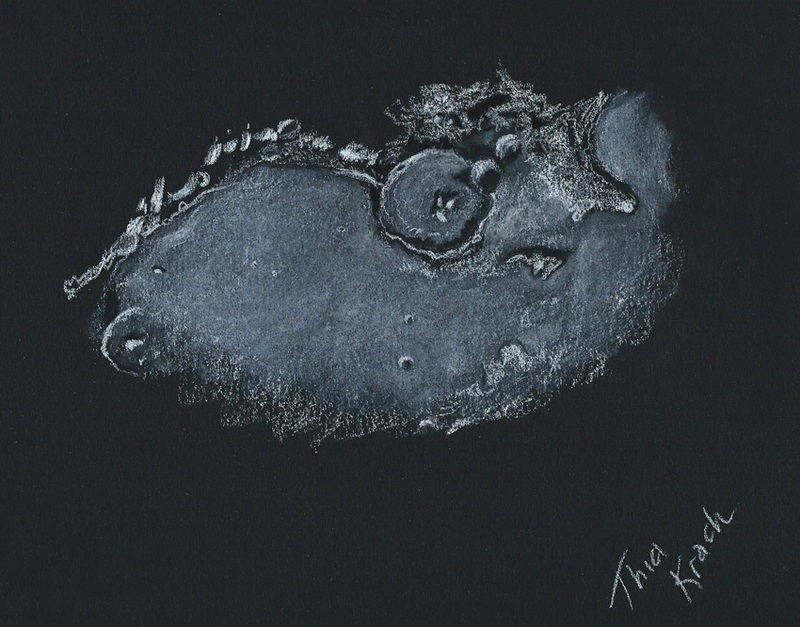 While archiving the sketch this morning I realised I already sketched this part of the Moon almost a year ago, so I got the idea of a side by side comparison to show the effect of lunation. To my surprise I found out these sketches were made at the exact same lunation: 15.5 days. 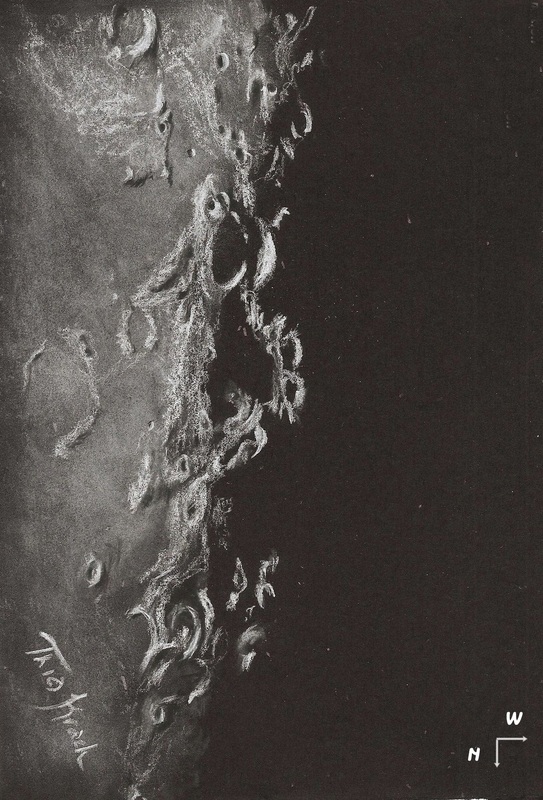 The difference in lighting therefore had to be caused mainly by the Moon’s libration; the slow wobbling of the Moon in its orbit. 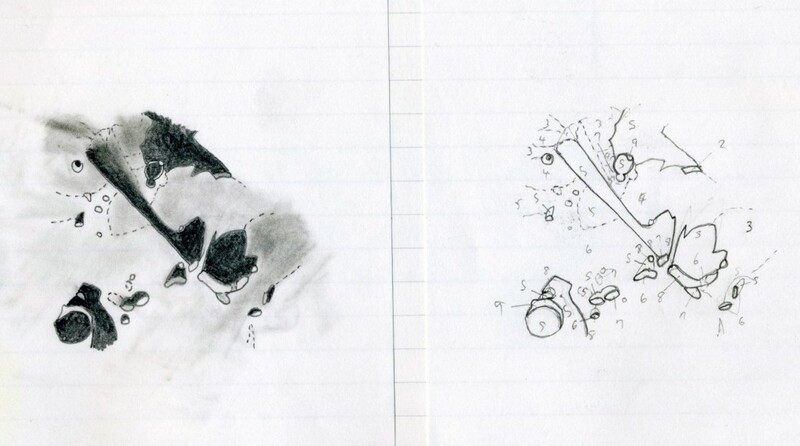 A pleasant suprise to find out I sketched this phenomenon totally unintentionally! 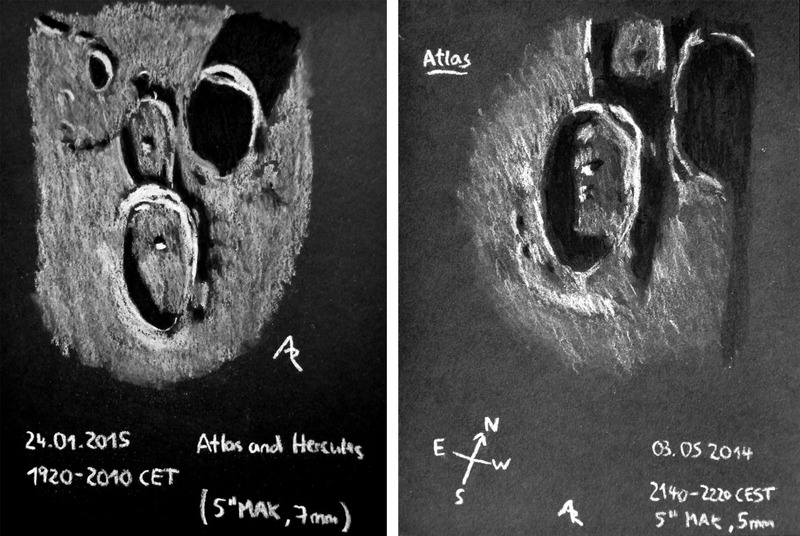 Both sketches were made using a 3″ Polarex Unitron refractor at 171x, with a white pastel pencil on black paper. Orientation and size were matched using Photoshop. It has been cold in Chicagoland and although it was sunny most of the day, high cirrus clouds moved in after sunset to block out all stars fainter than 3rd magnitude. Ice crystals at high altitude generated a colorless halo around the Moon. Not the best conditions for sketching but the first chance in 4 weeks for me. 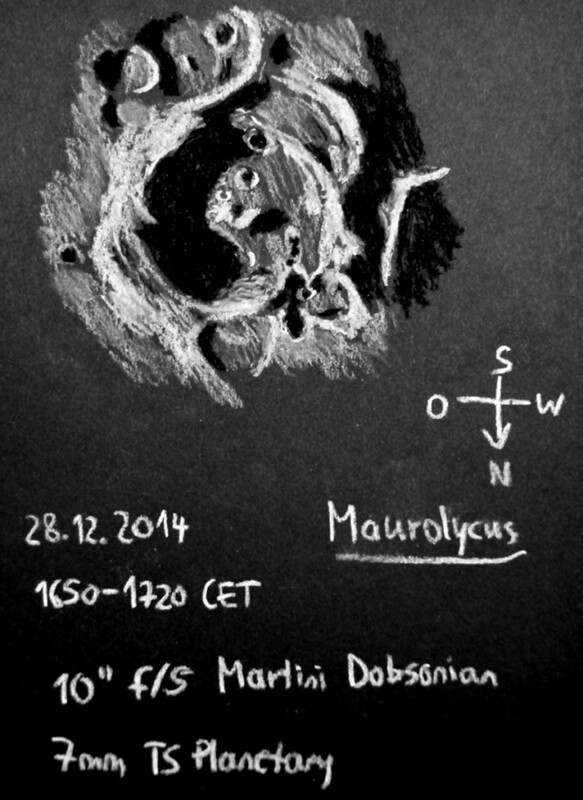 My target for this sketch was the pair of craters at the southern edge of Oceanus Procellarum. 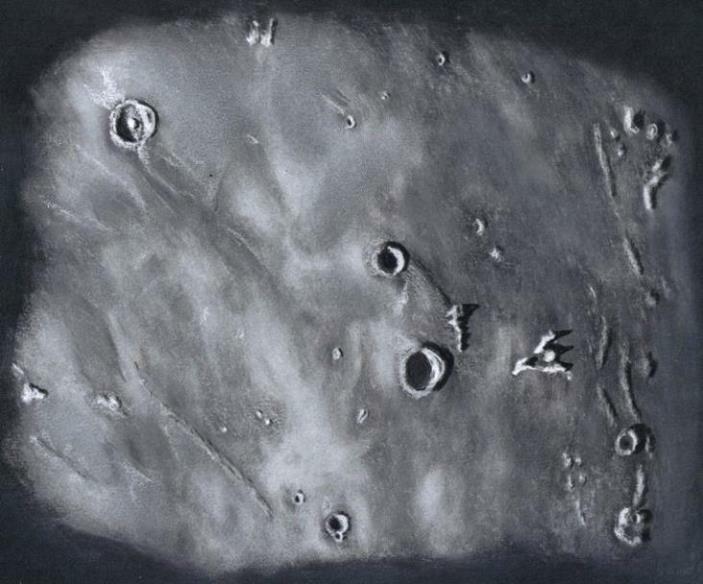 Crater Billy (46 km.) 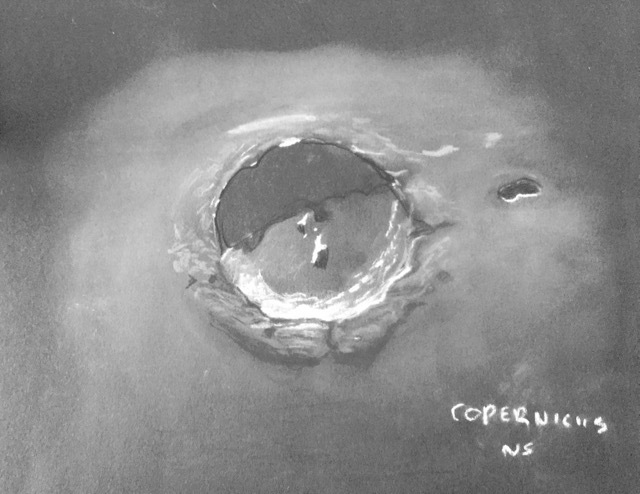 with its dark smooth lava covered floor and crater Hansteen (45 km.) with its hilly, irregular floor and terraced walls present contrasting looking craters of similar size and age. 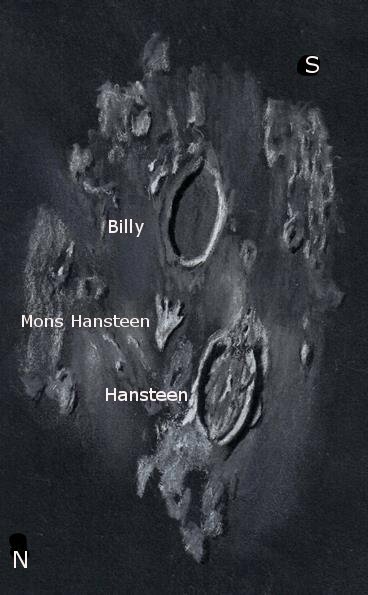 Between these craters is a large arrowhead shaped volcanic extrusion feature called Mons Hansteen. This object always looks very bright at or near full Moon. I have been lucky enough to have clear skies the past 3 nights and took advantage of sketching some feature of the Moon every night. 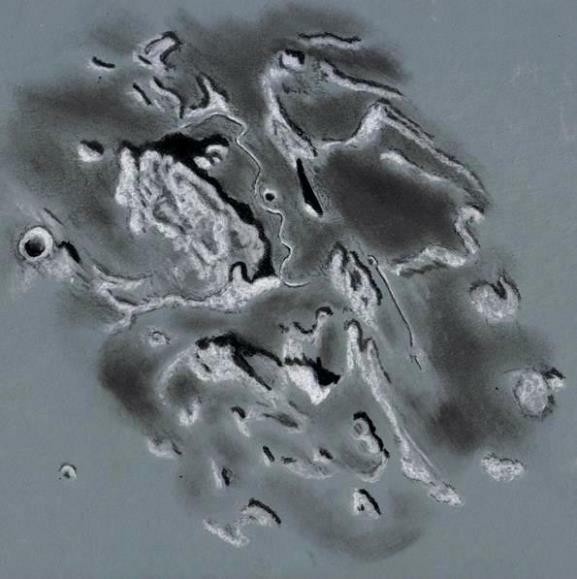 On 12/1/14 my eye rested upon the partly eroded walls of Capuanus Crater and the surrounding region north of Palus Epidemiarum. At the time of the observation the 60 km wide crater cast a deep shadow to the west and over a rim of rock placing it partially in shadow. Smaller Elger Crater is visible just to the west of the rim of Capuanus just beyond the shadows. A multitude of smaller more complex appearing craters border the southern edge of Capuanus. 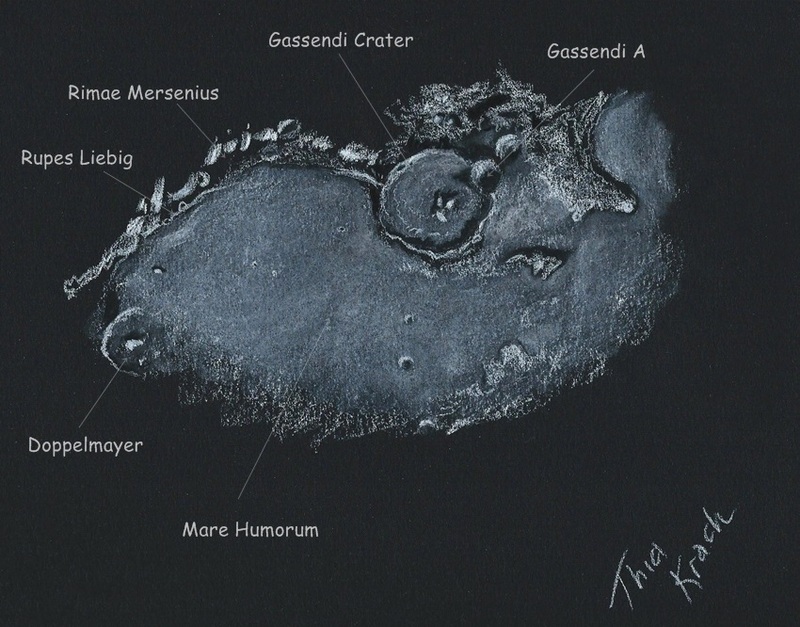 The small mare of Lacus Timoris (Lake of Fear) can be seen to the south near the terminator. 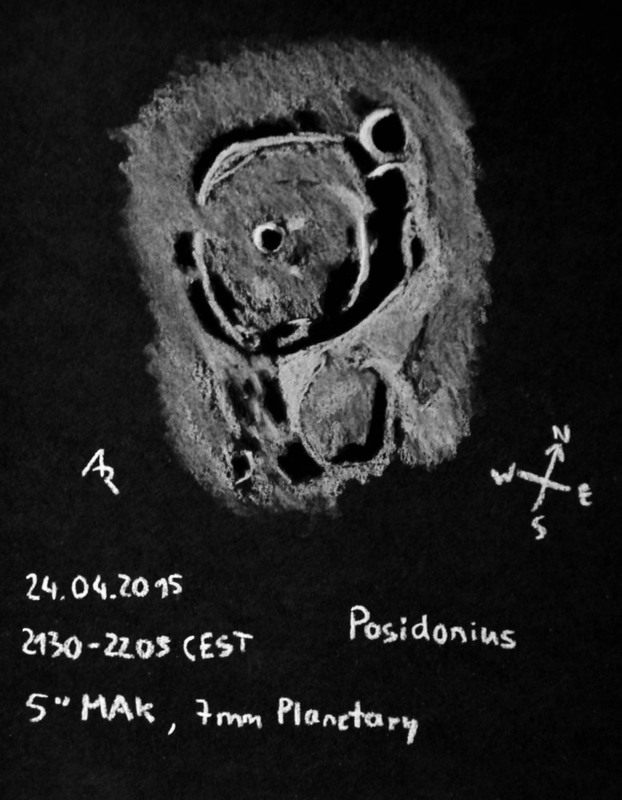 Posidonius; in addition I sketched the crater and other features on the floor of Mare Serenitatis. Posidonius (96 km.) is an old upper Imbrian era impact remnant. Its age is underlined by the way shadows penetrate the rim at numerous points betraying impact damage there. The highest part of the rim is on the terminator side of this crater. Sunlight was still reaching Posidonius A and other high points on ridges including one on the inner ring. Beyond this crater to the west and south the great serpentine ridge could be seen in best light. This ridge is made up of dorsa Smirnov and dorsa Lister. For this sketch I used: black Strathmore 400 Artagain paper 9″x 12″, white and black Conte’ pastel pencils and a blending stump. 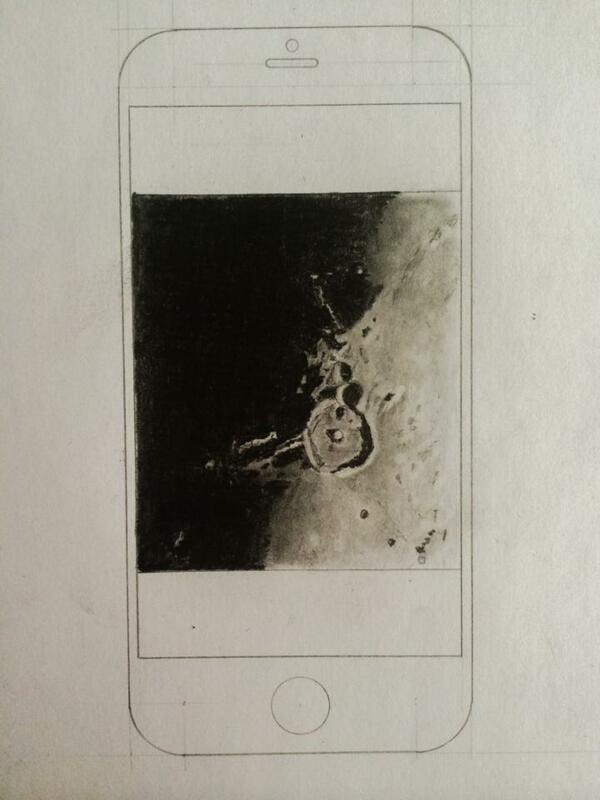 After scanning, Brightness was decreased just slightly using my scanner. Not really an astronomical observation more a romantic interlude. 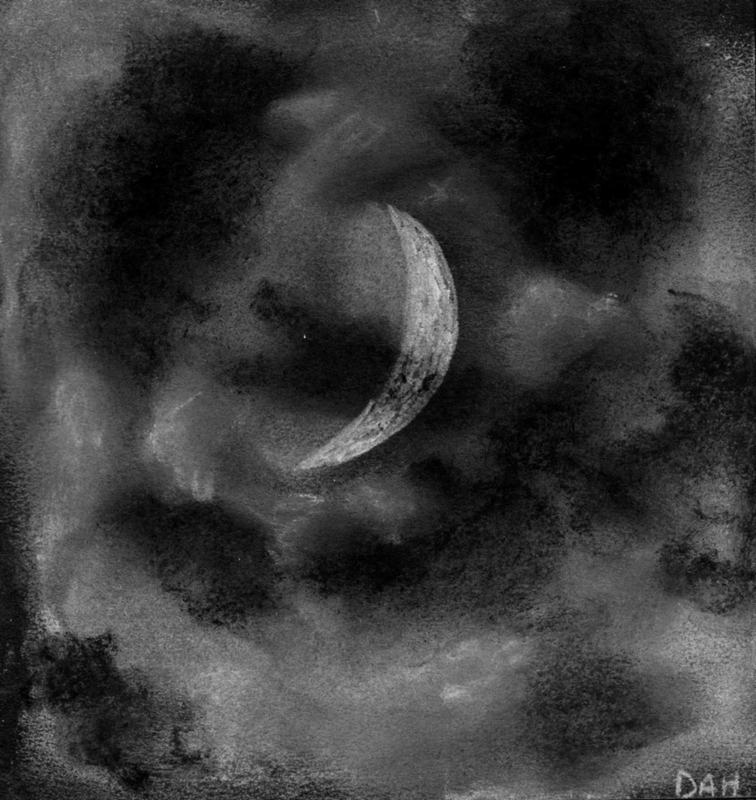 yesterday evening, I got the opportunity to do another chalk/charcoal sketch of the moon. 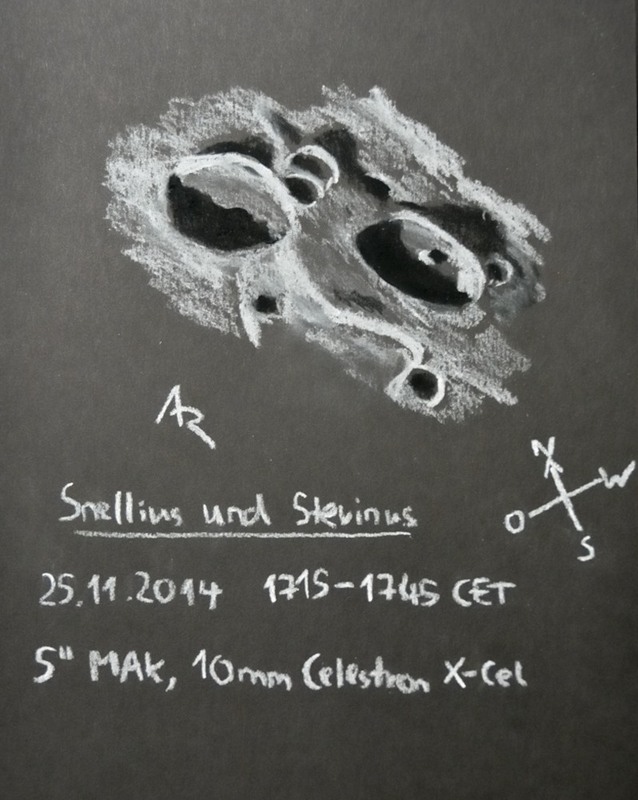 Here we go with my sketch of craters Snellius and Stevinus. Due to the bad seeing, I couldn’t go beyond the 10mm eyepiece this time. crater can be seen extending from the base of the glassy glacis in all directions. rebound of this deep rock through the surface crust following the impact event. opportunity between two days past first quarter and one day past last quarter. Weather permitting, you can see it tonight. black Conte’pastel pencils and a blending stump. 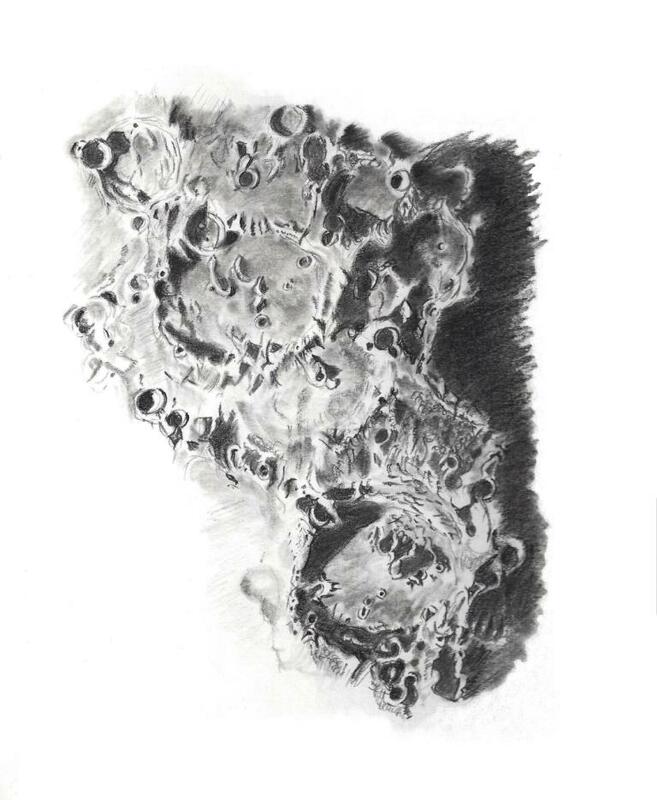 My sketch of lunar crater Clavius together with smaller craters Porter and Rutherfurd at the top of the drawing. 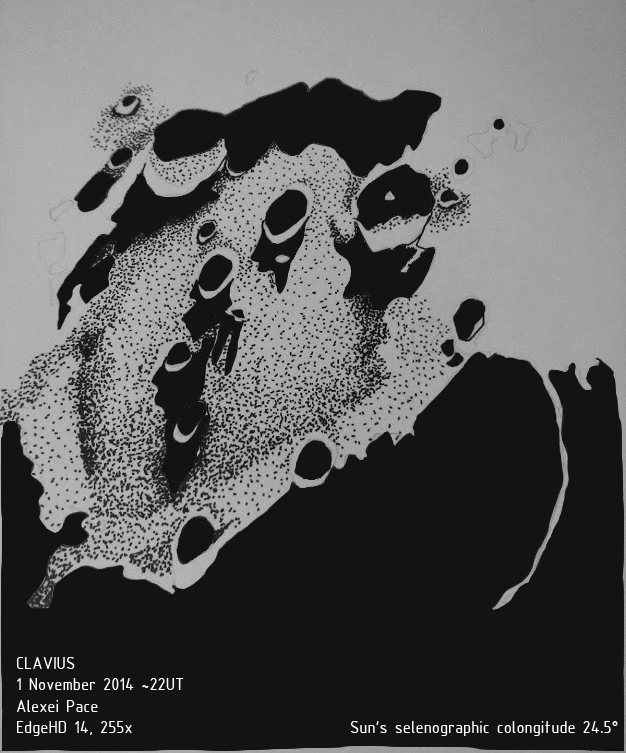 Clavius measures 225km in diameter and is located near the southern pole of the Moon. 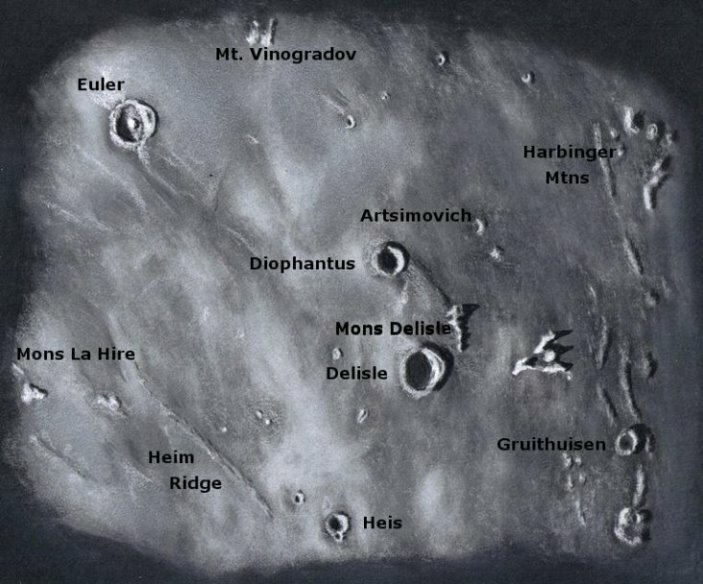 It is named after Christophorus Clavius, a 16th century German mathematician and astronomer. The Aristarchus Plateau, the lunar crater Aristarchus and environs – October 5, 2014[/caption]The Aristarchus plateau is one of the biggest and most spectacular volcanic regions in the Moon. With good seeing and the Moon high above the horizon, the region was impressive on October 5th, when it was near the terminator. Vallis Schröteri, the giantic lava channel meanders through the plateau starting from the famous Cobra Head vent, which is now mostly under shadow. The Aristarchus crater has a very bright wall with two dark bands; and to its north, Rupes Toscanelli stands out nicely. Finally, to the south of the plateau, the Herodotus Omega dome is easy to see, thanks to the oblique illumination. Media: Graphite pencil H2, H3 & B6 with standard white stock and technical drawing equipment. This is actually sketched as observed through the eyepiece with a 15mm on a 9.25 SCT rather than from the phone screen. The seeing was fair but a weather front was fast approaching and just managed to observe long enough to capture this detail. At the same time I took some snapshots through the eyepiece with my smartphone for a smartphone astronomy site – so got to do both before the clouds rolled in. Adding the phone to the sketch allows me to add a technical drawing into the mix which I not (only) enjoy but also allows me to capture the evenings activities and optical equipment used during the session. Media Black graphite pencil on a white paper. Contrast adjusted with PC. After outlining major features using solid lines, dotted lines and numbers(1-9) are used to express gradation in brightness(right). The numbers are replaced with “real” darkness after the lines are copied on another paper (left).